I used to love playing dress up. 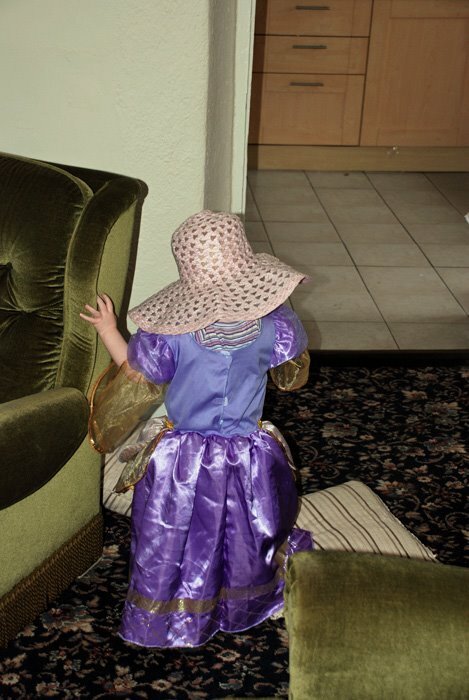 As a kid, some of my favorite dress up items were my mom’s things. Her mustard-yellow pleather jacket, any of her shoes, her kerchief she’d wear on her head when she would clean or play softball. I would spend hours daydreaming and making believe about having my own home, my own husband, my own children. Today, I watch my own daughters do the same thing. If they are not in their school uniform, and we are not having to go out in public, they are putting dress up clothes on. Usually princess attire of some kind, but the make believe worlds remain the same: castles, princes, knights, babies, and houses. They even clean while in their make believe worlds, and its fun!! (granted, when its time to actually clean, they might as well be Cinderella with no hopes of ever getting to the ball, but that’s a different post for a different day…) Countless hours are spent preparing exquisite meals, attending gala events, taking care of babies, and living the perfect life. Everything is in order, everything is fun, everything is easy. I never hear them suddenly have a breakdown because the grocery store was out of the right cereal, or rush in a mad panic because their prince has no clean clothes and his prince business meeting starts in 30 minutes. It’s all a fairytale, and they can’t wait to live the real deal. A few days ago, I was having one of those days. You know what I’m talking about. An uh-oh-every-one-walk-softly-around-Mommy, nothing’s-going-according-to-plan, baby-won’t-nap-big-kids-won’t-stop-fighting-not-enough-chocolate-in-the-world day. As I stared at the kitchen, which somehow had vomited every dish that had been clean 5 seconds ago out onto the counter, sink and table I suddenly felt as though I had been playing dress up for the past ten years. Like I’ve been traipsing around in a chiffon gown, in shoes 8 sizes too big and an over-sized bag stuffed with six blocks, a Barbie doll, and an egg full of silly putty (hey, you never know when you need that stuff!) slung over my shoulder and all the answers to the world’s problems in my head. It hit me like a ton of bricks: I’m a wife!! I have three kids!! I have no idea what I’m doing!! Playing dress up. As kids, we do it to imagine life in another time, another world, another place. We do it to dream and plan and hope for what may one day be reality (ok, so I didn’t get to live in a wedding gown everyday of my adult life, but loads of my other daydreams came true). As grown ups, it seems we do it to impress other people, to hide from our responsibilities, or to cover up immense pain and heartache we hope no one else can see. I felt so impressed in my heart that day that I need to stop playing dress up. I need to let those closest to me see the real me, warts and roses and all. I need to let people in, let them help, let them share in my victories and well as walk with me through struggles and defeat. And most of all, I need to let the One who knows me more intimately and deeply than any other clothe me. I need to soak up all the strength, energy, peace, and wisdom (aka life’s answers!) that I know time with my Best Friend brings. I know from experience, though I tend to forget for reasons I don’t understand, that it’s when I hang out Him that I am the truest version of myself, chiffon gown not needed. Are you “playing dress up”? Do you ever put up walls, or fronts, to avoid appearing weak or needy? Visiting from Miss-Elaine-ous Monday… What a wonderful revelation. I’m pretty sure most of us are just making it up as we go along. Plenty of times I feel like I have no idea what I’m doing, but my kids seem to be happy & healthy so I must be doing something right. Bet you are too :-).